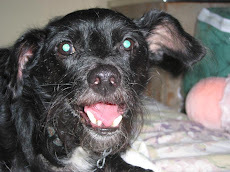 My dogs says today we're here to tell you about kitty food! 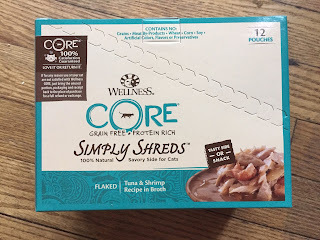 Specially, Wellness Core Simply Shreds. Is it a hit or miss with our resident feline, KitCat? We tested it and here are our results. 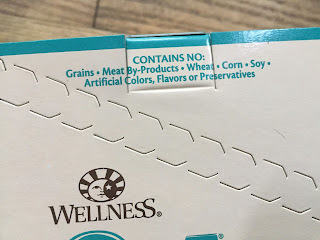 We're big fans of simple ingredient lists and this variety of Wellness Core is exactly what we like to see. Four ingredients. Total. No weird names you can't pronounce or don't know what they heck they are. It is simply tuna, fish broth, water sufficient for processing, and shrimp. That makes us super happy. We know exactly what KitCat is eating, and it's ingredients we feel good about. No fillers, grains, or starches; just solid protein with Omega-3 fatty acids for good health. 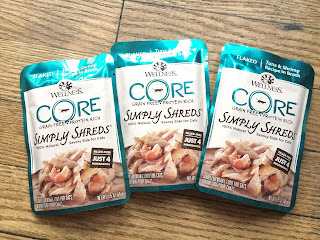 This variety of food, the Simply Shreds, comes in pouches. It's a nice single-size serving and comes with ample broth. It's not a stew type broth, more of a clear one that just keeps everything moist. On the broth/pouch note, we only have one complaint. If you don't manage to tear off the top of the pouch all the way the first time, and have to go back to pull the rest of it off, you may end up with a mess. If the pouch is partially open and you go to put the top off the rest of the way, there's a strong likelihood you'll squeeze the pouch just enough to have fish broth and water come out the top and start dripping down your hand and arm. So word to the wise, pay attention when you tear so you pull the top off all the way across the pouch. 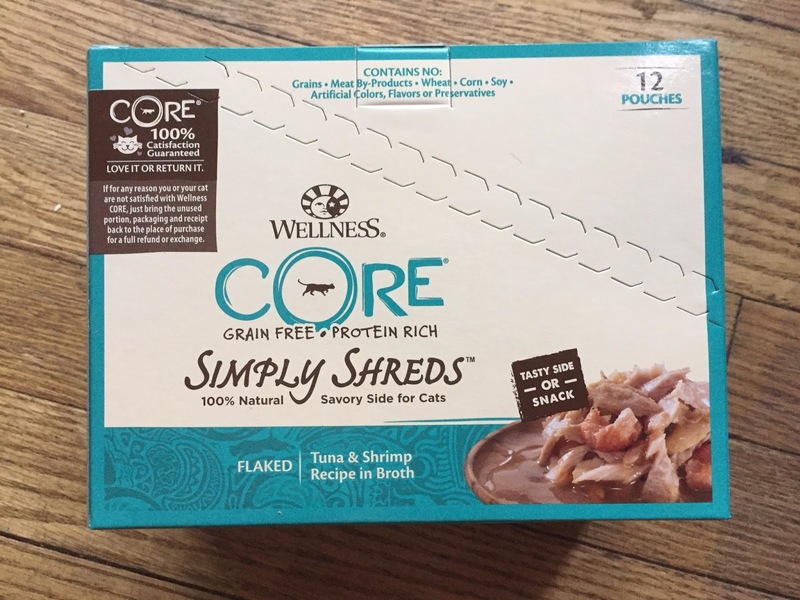 The Simply Shreds can be used as a topper for kibble or canned food, a side dish to your cat's regular meal, or as a snack all on it's own. We chose to use it as a snack so there weren't other tastes mixing in and KitCat could sample the product without distraction. He lapped up all the liquid enthusiastically and then I looked away for a minute. When I looked back, all the meat was gone. And I mean gone. No evidence there had been anything in the dish. 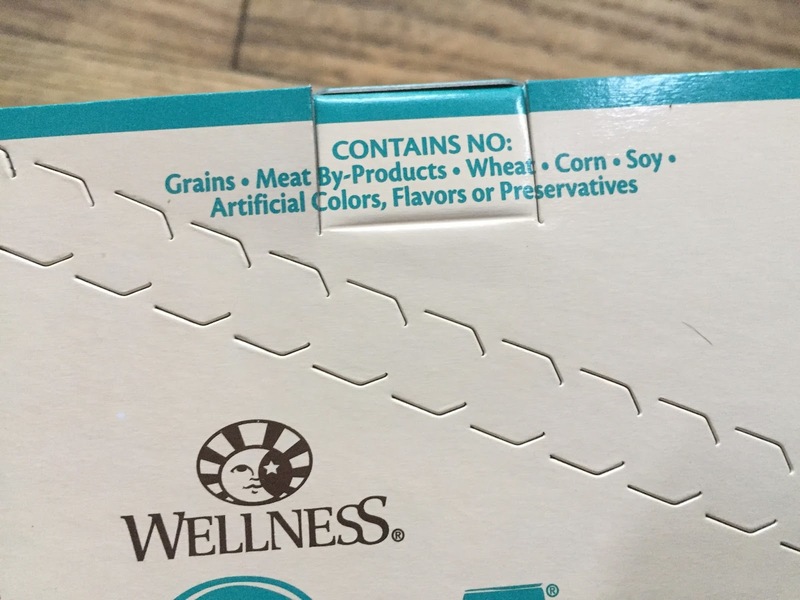 In regard to packaging, you can either open the box at the top or tear diagonally along the perforated lines so it creates a retail-like holder for the pouches. It's actually nice to have a choice so you can store the food in a way that makes the most sense for you and your pantry/kitchen. UPDATE: Since this review was published, the origin of this product has changed. It is now made in Thailand. The current cost on Chewy for the Wellness Core Simply Shreds is $14.49 for a 12-pouch box, each 1.75 ounces of food. Although this costs a little more than regular food, it's a high quality product and falls into the "you get what you pay for" category. As you can probably already tell, KitCat LOVED this food. L. O. V. E. D. (Yes, he's hard to see in the photo above because black cats don't photograph well, but you can absolutely see his tongue lapping up the broth!) We felt like we were doing something special for him when we saw how much be enjoyed this food. It was like he thought he was getting a special reward for being a wonderful kitty. Our rating? Well, our top rating is four paws but that doesn't seem to be enough. So, let's just say we give this a four-plus-plus-plus. This is absolutely a product we'll be getting again and again.